may be more known, loved and invoked. may give us peace and salvation. It was April of the year 1656 when a tremendous pestilence infested the city ofNaples, with so much force that in the following May the city remained almost completely uninhabited, to the extent that grass began to grow on some of the streets. This mortal infection spread from the city ofNaplesto all the kingdom with equal fury and force, and with equal slaughter. Even the region of Puglie remained desolated, and great was the terror which dominated the souls of the populations. Between the end of June and the beginning of July of the same year, the devastating epidemic came to strike also our city of Corato, infesting it in such a way that in a few days several hundreds of victims were counted. As soon as a blackish area, called bubbone, appeared on any part of the body, a fever immediately came, so burning that in a few hours the poor patient was reduced to a horrid cadaver. In vain the science of medicine tried to prescribe cures; in fact, doctors themselves were among the first victims. So, since there was no possibility of any human aid in such sorrowful anguish, the people, terrified, recurred to the intercession of their Protector Saints, and mainly to that of Most Holy Mary. In the meantime many people, and most especially the elderly, knew that according to tradition there was a prodigious image of the Most Holy Virgin in the vault of one of the twenty-five towers which crowned the walls of Corato, and, specifically, the tower which looked to South-west. Many thought that if that image were exposed to public veneration and homage of the faithful during such great calamity, the town would have been freed from the terrible chastisement. As the news spread out, a crowd of people thronged around the mentioned tower. An opening was made. The humid and dark vault or cave could hardly be seen, which was not connected with either the ground level or the near street. The anxiety to see and venerate the sacred liberating Image, and the fear, among few, to precipitate into the vault, held some people back, attracted others, or pushed others away, according to their different feelings. But all were debating on what to do in order to find the Image, so greatly longed for, and therefore expose it to the veneration of the community. At that moment the pious and erudite Priest, Don Francesco Lojodice, called Saccone, passed by. He was one of the people who had been elected to provide for the needs of the town during the period of the deadly scourge. In seeing so much people being gathered, he exhorted them to leave, both because the crowding of people in those calamities is always a new and greater reason for contagion, and because he feared the arising of superstition and error, which usually spread among common people in these painful circumstances, finally, because he feared that some accidents might occur. Therefore, he tried to lead the great number of people away from the entrance of the cave. However, he spoke and explained his reasons in vain, because nobody moved from there. On the contrary, holding lamps at the entrance of the cave, all pleaded the Virgin for pity and mercy with loud cries. In order to eliminate the danger of falling into the cave, Don Francesco had the entrance widened. Then, he himself went down on a ladder and with a torch. However, as much as he tried to be diligently attentive, he could see no Image, but only a little window with some traces of an ancient painting, from which no figure appeared. The little window is clearly the one that can be seen still now on the original altar. But who can ever penetrate into the admirable and inscrutable ways which the Divine Goodness uses when It wants to manifest Itself to the creatures, either by offering Its gifts, or by relieving the afflicted and troubled mankind? So, prey to many thoughts and different feelings, the pious Priest Lojodice came out of the vault feeling a change and a restlessness within himself which he did not know how to explain. In order to be freed from so much uncertainty and perplexity, through prayer he recurred to God, the Provider of holy advice. At the dawn ofJuly 17, 1656, while Don Francesco was humbly recollected in prayer, he had a special vision. The Most Holy Virgin appeared to him shining with light, and with the same features which can be seen today in the Picture representing the Greek Madonna. With majesty and love, She said to him: “Courage, my beloved one, console these afflicted people. They will be soon freed from the tremendous chastisement of the anger of God, if the cave which you know will be dedicated to my honor and to my veneration.” Immediately after, the vision disappeared, leaving the good Priest in great peace and consolation. Don Francesco, the fortunate one chosen by Mary, hurriedly went to Trani in order to relate the event to his Archbishop, Monsignor Tommaso Sarria, a Spanish Dominican. He did this in order to be more reassured on the truthfulness of the apparition, submitting it to the judgment of his legitimate Superior, since it is possible that, in these extraordinary things, there might be diabolical deceit and suggestion; and also to obtain permission to transform that cave into a public Oratory, and open it for public veneration. Having been completely reassured by the illustrious Prelate on the fact that everything was a work of God, and having received wide authority to implement what he had asked, Don Francesco could think about nothing but to fulfill the desire and command of the Most Holy Virgin. On the following day, July 18, the third Saturday of the month, early in the morning, Father Lojodoce was already in the vault together with several workers. Some were intent in widening and securing the entrance of the vault, some in cleaning it from rubble and soil; some were carefully leveling the ground; some were painting the walls; some began to raise an altar. In very little time, all contributed to transform that dark and gloomy cave into a decent Oratory. In the meantime, having given the necessary dispositions to everyone, Don Francesco intended to implement his dominant thought: to have the Image of the Madonna painted on a walnut board. He called a painter and orderd the painting to him, explaining the him the details of the figure which had to be reproduced, just as the one which had appeared to himself. But for as many different drawings and sketches as the artist presented to him, not even one corresponded to the one which he had requested, or better, to the one which he had seen in the vision. At about midday, various people, among them the painter, returned to their homes, while Don Francesco and many other people, animated by unlimited confidence that the Great Virgin would have accomplished the work, had recourse to Her with vivid faith, begging Her in fervent and unanimous prayer. As the fervent prayer was rising up to Heaven, the abundance of the divine mercy descended from the Throne of God. Oh, prodigy! Oh, astonishment! Oh, truly maternal mercy of Mary! A harmonious sound of a little bell was heard, not only in the vault, but also outside, in the whole neighborhood. It was so sweet as to astonish all those who heard it. This lady used to be blind, and all knew her as such; but as soon as the Image of Mary, which we venerate under the title of Saint Mary the Greek, miraculously appeared, painted on the walnut board which had been prepared by the painter, she gained back her sight, being the first to point out at the prodigious Image. A great crowd immediately rushed up, and all fell on their knees before the Sacred Image, with tears in their eyes. Trembling with emotion, they began to joyously praise and thank the Virgin. Some of them, with irrepressible affection, began to place loving and respectful kisses on that venerable board; others, considering themselves unworthy, humbly and respectfully kissed the ground. Some said, like the old Saint Simeon, that they were content to die after having seen such great prodigy with their eyes. Some others recognized the mercy of the Lord which had spared them from the slaughter of the plague, giving them the chance to admire such a marvelous prodigy. Moved as they were, all promised persevering veneration and filial devotion to this tender and loving Mother and Queen. And She really proved Herself to be a Mother of our fathers, because, from that day on, not only did the terrible infection cease completely, which had claimed many victims, but many patients who had been attacked by the disease, soon improved and were healed. The deaths ceased to the extent that (according to the tradition of our fathers) in the following August our city was completely freed, thanks to the special favor of our Mother Mary, while other neighboring towns were still frighteningly terrified and desolated. In fact, among them,Andria, which is seven miles away from Corato, was reduced to a third of its population, since about fourteen thousand people died. It was freed only in January of the following year, 1657, after making a vow to Saint Sebastian, the martyr. The Image of the Greek Madonna is portrayed on a walnut board, 106 cm high (41.7 inches), 74.5 cm wide (29.3 inches). The observer can see a great August Lady, majestically seated on clouds, Who seems to demand respect and reverence with Her posture, inspiring devotion and love at the same time. Her garment, cherry red in color, and with wide folds, is tightened on Her waist with a belt, dropping down to Her feet, which wear sandals. The blue mantle, gathered on Her breast, is tied on Her right shoulder and descends like a Royal Mantle. Baby Jesus, seated on Her left maternal knee, is in the act of blessing with His right hand, while His left hand holds the world with a Cross. He wears a white little tunic and a blue mantle, with the same fashion as the one of the Virgin Mother, similar to Greek costumes. On the right side, upon the clouds, at the feet of the Madonna, there is a little bell, while on the left side a vertical large crack is on the board. In the antique memories, two opinions explain why this Image received the name of Greek Madonna. The first one says that the name of the tower in whose vault the apparition occurred was called Greek Tower, since it had been built by the Greeks during the time in which they dominated Puglie. The second one says that the name comes from the Greek style of the garment of the Madonna. Father Cosma Lojodice added a third explanation to the others: that the name derives from the Greek Pastoral Cross which the Virgin holds with Her right hand. In any case, we can affirm with certainty that the Most Blessed Virgin likes this title, because not only in Corato, but also in other cities of the kingdom She let Herself be called by this title. In fact, in Putignano, a city of thisProvinceof Bari, there is a great Church dedicated to Saint Mary the Greek, because of an ancient Byzantine image portrayed on canvas, which is placed on the major altar. 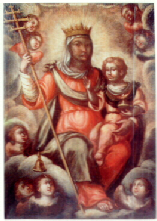 This ancient image of the Madonna was brought to Putignano by the Knights of Malta in 1395, together with the relic of Saint Stephen. Moreover, in the city ofRavenna, Lombardia, a miraculous Image of Saint Mary the Greek has been venerated since the year 1100 in theChurchofCanonici Portoghesi; and from that veneration the Congregation of Canonici Portuensi started. Speaking about the image, I believe it is necessary to draw the attention of the reader to the fact that that wood board on which it is portrayed, except for some particular circumstances, has never been removed from that vault, which drips with thick and constant humidity, still noticeable nowadays, which consumes and destroys everything. However, although more than three centuries have passed since the Madonna was pleased to appear, the board has received no damage, from woodworms or humidity, as if it had been placed there only recently, while the works of golden wood with which Rev. Don Francesco La Monica had decorated the chapel, including the new altar with which he had substituted the previous one, had to be removed in 1764, because of woodworms and humidity, and substituted with more recent works in stucco and travertine. Since the year of the Apparition, it was established to solemnly celebrate in the Church the feast of the Virgin, the Sunday which follows July 18. A few years later, Rev. Capitolo, in order to publicly testify his love and devotion to such a great Protector, established that every year, on the Feast day of the Madonna, the faithful should make a procession toward to vault, and sing a solemn Mass in it. This praiseworthy tradition, so much appreciated by all the people of Corato, lasted for a few more years. I have already spoken about the Miraculous Apparition of the Image of the Madonna; the sound of the little bell which was heard for the first time in the vault of the tower; the blind lady, Beatrice Dell’Oglio, who regained her sight; the recovery of the city from the pestilence; the present conditions of the Picture, preserved as intact in the very humid vault. These can be justly called miracles. – Can. Don Domenico La Monica and Dr. Don Vito Giacomo D’Ambrosio testified that in the year 1663, when they were just twelve years old, they were in the vault of the Blessed Virgin, while the chosen one of Mary, Father D. Francesco Lojodice was exorcising a possessed person, called Dionisio, who had been brought from Barletta in order to plead the Greek Madonna for the liberation from the evil spirit. As sign of respect and great subjection to the prodigious Image, while doing the exorcism, Don Francesco commanded the demon to set that unhappy person free, and to light in one instant all the candles that were placed before the Madonna, which Father had carefully extinguished before. As soon as they started to recite the Laurentane Litanies, at the invocation “Sancta Maria, ora pro eo” [Saint Mary, pray for him], the poor possessed one fell to the ground like a dead body, and at that very moment all the candles were lit – and they were not few. Dionisio was raised up from the ground, safe and sound, and was given back to his parents, who happily and joyously manifested and praised the wonders performed by the Greek Madonna. – Don Sebastiano Merra also passed on to posterity that, in the year 1670, a certain Giovanni fromAltamurawas brought by his parents to visit our Healing Image. He too had been possessed by an evil spirit for many years, with great torments, contortions and sufferings. As Don Francesco Antonio Mosca was exorcising the unhappy young man fromAltamura, the demon promised to come out; but then, with vain and futile pretexts and excuses, and with inconceivable pretenses, he deluded the promise. Among the rest, he threatened to ruin the bell tower of theMatriceChurch, as soon as he had left. This was prohibited to him by Rev. Mosca, who also imposed him, in the Most Holy names of Jesus and Mary, to cause no harm of any kind to human beings, animals or buildings. The demon said that, because he was forced by his implacable enemy (the Most Holy Virgin) to abandon that residence, which he had freely possessed for so many years, he wanted to give a sign, which had not to be opposed. Questioned on what the sign would be, he said: ‘I want straw to rain upon all Corato.’ Perhaps he was forced by the Madonna to give that sign, to show how the souls of impenitent sinners fall into hell. The permission was granted. In the meantime they started the Litanies to the Virgin; and as the prodigious Image was uncovered, the possessed Giovanni collapsed to the floor, while tiny and thick straw began to rain upon Corato like snow, causing amazement and great surprise in those who ignored what was happening before the portentous Image. As the Litanies were completed, free from the demon and with no harm, Giovanni was raised up from the floor, and recovering immediately from the diabolical trouble, he gave thanks to the Madonna, and went back home, safe and sound. – OnJuly 15, 1710, Fr. Domenico Candido was caught by a deadly fever. The Saturday before the Feast of the Apparition of the Greek Madonna, he offered his life to God, since the doctors despaired of his recovery, among the crying of his family and of all the good people who had admired him as an exemplary Priest. They were already preparing the funerals, when the mother of the dying implored Heaven to grant what men could neither promise nor concede. Making an heroic resolution, which only her maternal and Christian love could inspire in her, went crying to the feet of the Image of the Greek Madonna together with her other three children. How much faith and trust does a Christian mother not have in these similar circumstances? After singing the Litanies, she also offered a Mass at the Altar of the Madonna. Maria, Who is Mother, and Mother of sorrows, and Who had given Herself to our fathers in a similar circumstance of mourning and sorrow, could not remain indifferent in front of such mourning and pain of a mother, who had left her son dying in his bed to have recourse to Her. At the moment of the elevation of the Most Holy Host, the illness immediately lost its vehemence, and stopped. The agonizing Fr. Domenico felt much better, and recovering completely in a few days, went to thank his great Benefactor for having saved his life. He celebrated Mass at Her Altar and offered precious sacramentals as sign of gratitude. Fr. Domenico celebrated with great magnificence the Festivity of the Virgin for many years; and as long as he lived, he greatly promoted devotion and veneration to Her. He also left in his testament the order to his heirs to light a candle before the Altar of the Madonna every Saturday. Before closing this chapter, for greater honor and glory to our Greek Madonna, and as a confirmation of all that is written above, I feel the duty to publish what follows. – Only one year after my nomination as Parish Priest of Santa Maria Greca, onFebruary 11, 1938, I was suddenly caught by an intense fit of angina pectoris, which reduced me to extreme conditions; so I asked for the administration of the last Sacraments. Moved by great confidence in the mercy and power of our Holy Virgin, some souls immediately went to the feet of the miraculous Image. With prayers, tears and sighs, they asked Her to preserve me for the care of the new flock which the Lord had entrusted to me. Aroundmidnight, the people around me started to notice a slight improvement; and at about four in the morning, all of a sudden, I felt completely recovered, announcing to all, among tears of consolation, that the Madonna had granted me the grace of instantly freeing me from any pain and illness. So I conclude here, for the honor and the glory of our Virgin, these Historical Memories about our Greek Madonna, in this year, 1956, in which we are about to celebrate the Third Centenary of Her Apparition. For many, many years, one has no longer heard the devoted and harmonious chanting of the large and numerous groups of pilgrims who came from afar in order to visit, to thank, to offer gifts and vows to our Image, as it happens still now in Gargano, at Incoronata, at Saint Nicholas, and in many other Shrines. Those pilgrims used to silently cross our city, where their fathers came in order to venerate the Image of the Greek Madonna. The near and neighboring cities have forgotten our portentous Protector. That multitude of devoted people who thronged in our little Sanctuary, in which their sick invoked the Greek Madonna for relief and remedy to their troubles, no longer comes from them. Even many Coratini [people from Corato] seem to have forgotten their Protector, Her vault, Her venerated Image, therefore becoming more responsible than others for this deplorable oblivion. Oh, if Lojodice, Candido, La Monica, and many other zealous Priests of the devotion our Protector, could raise their heads from the dust of their sepulchers – how surprised they would remain at the sight of so much ingratitude toward that venerable Image which freed our fathers from the pestilence, which cured many sick, healed many crippled, freed many possessed souls, and made everyone feel the benefits of Her protection!!….. Oh, how much just and holy indignation would not ignite their apostolic zeal, toward such degenerate citizens! May such sorrowful indifference, and such ungrateful oblivion cease once and for all, at the rising of a new and multiplied spirit of faith and love toward such a great Mama; and may this Third Centenary of the Apparition of the Madonna restore in all the devoted, near and far, the sincere fervor which animated our ancient Fathers.